WELCOME TO ROCKY’S CAFE. WE ARE AN AMERICAN DINER STYLE RESTAURANT LOCATED RIGHT OFF OF THE STERLING HIGHWAY IN THE TOWN OF KASILOF. 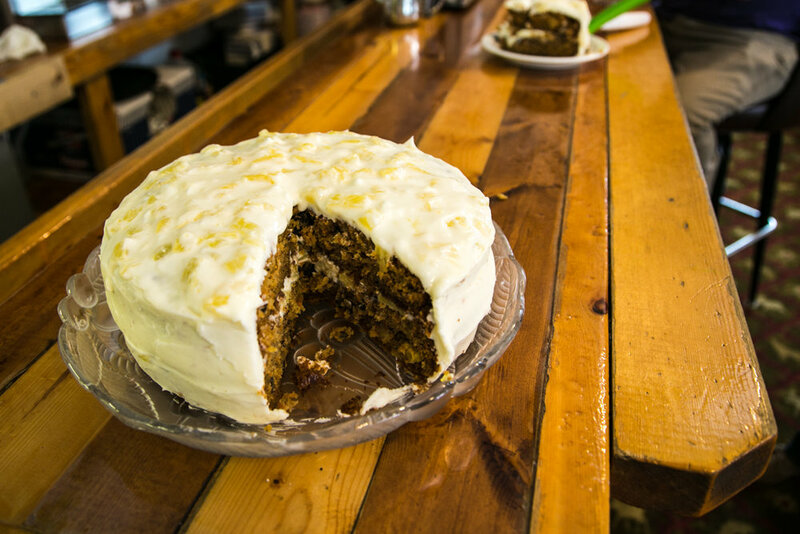 Rocky’s Cafe is located directly off of the Sterling Highway near the banks of the beautiful Kasilof River. Specializing in American Diner style food, our specialty, hand made plates will be sure to satisfy your appetite. Our Restaurant in Kasilof is known for our friendly family-style atmosphere, and is great place to enjoy some food after a hard day on the river. Stop on by for a bite, we look forward to seeing you. Crispy hash browns, reindeer sausage with grilled green peppers, mushrooms, and onions. Topped off with two eggs and melted cheddar. Your choice of biscuit or toast. Fried Steak smothered in country gravy, served with two eggs, hash browns and toast. Comes on two plates. You have been warned…..
One fried egg, cheddar, and choice of ham, reindeer sausage, pork sausage, or bacon on an english muffin. Eggs stuffed with crab and shrimp, provolone cheese, and your choice of veggies, sided with hash browns and toast. Three eggs wrapped around your choice of ham, reindeer sausage, pork sausage, or bacon, cheese, and three veggies. Comes with hash browns and toast. Two poached eggs with Canadian bacon on top of toasted english muffins with hollandaise sauce. Two eggs, hash browns, and your choice of ham, reindeer sausage, pork sausage, or bacon and toast. Two slices of french toast served with two eggs and your choice of ham, reindeer sausage, pork sausage, or bacon. Southern style biscuits smothered in country style gravy. Fluffy buttermilk pancakes with a side of two eggs and choice of ham, reindeer sausage, pork sausage, or bacon. Delicious crab and shrimp piled high with cheese on freshly cut lettuce, eggs, tomatoes, olives, red onion, and bell pepper. Fresh lettuce covered in ham, turkey, cheddar, swiss, eggs, tomatoes, olives, red onion, and bell pepper. Grilled or fried chicken breast on top of our fresh made salad seasoned to perfection, tomatoes, olives, red onion, and bell pepper. SANDWICHES ARE SERVED WITH CHOICE OF FRIES, TATER TOTS, HOMEMADE POTATO SALAD, OR COLESLAW. Turkey, ham, bacon, lettuce, tomato, and cheese on sourdough bread. Bacon, lettuce, and tomato on sourdough bread. Grilled chicken breast topped with melted provolone, shaved ham, and grilled pineapple on a toasted bun. Crispy fried or grilled chicken breast on a bun with lettuce and tomato. Chicken, bacon and swiss on a bun with lettuce and tomato. Hot crab, shrimp and cheese smothered between two pieces of sourdough. Hot corned beef towered with sauerkraut on rye bread with swiss cheese and house made thousand island dressing. Crispy fried cod fillet on a bun with lettuce, tomato, and homemade tartar sauce. Top Sirloin steak, mushrooms, onions, green peppers, and provolone cheese on a hoagie roll. Hot fresh smoked pork shoulder shredded over a sesame seed bun. our pulled pork is smoked fresh here at Rocky’s! Hot Roast Beef and swiss cheese on a hoagie roll, served with homemade Au Jus. OUR BURGERS ARE SERVED WITH A CHOICE OF FRIES, TATER TOTS, HOMEMADE POTATO SALAD, OR COLESLAW. SUBSTITUTE ONION RINGS OR SALAD FOR 2.99. ALL BURGERS ARE COOKED TO MEDIUM WELL UNLESS REQUESTED. All beef burger topped with bbq sauce, onion rings, cheddar cheese, with mayo, tomato, lettuce and pickles. All beef patty sprinkled with black pepper and crumbled blue cheese along with bacon. Comes with mayo, onion, lettuce, tomato, and pickles. Our 16oz. all beef patty provolone and cheddar cheese, mayo, tomato, lettuce, and pickles. Our famous burger with mayo, onion, tomato, lettuce, and pickles. 100% all beef patty grilled perfectly and topped off with cheddar cheese, mayo, tomato, lettuce, and pickles. All beef patty smothered with sautéed mushrooms and swiss cheese, comes with mayo, tomato, lettuce and pickles. Sautéed onions over a burger, with swiss cheese on toasted rye bread. 1/4 lb burger with mayo, onion, tomato lettuce, and pickles. Crispy Fried Chicken breast tenders with french fries and coleslaw. Crispy Shrimp with fries and coleslaw. Juicy Cod fried up in strips with fries, coleslaw, and homemade tartar sauce. 12oz. ribeye steak cooked your way with mashed or baked potato, and fresh veggies. We smoke a whole prime rib out back every weekend, you get a 14oz. slice served with homemade au jus and horseradish sauce, mashed or baked potato, and fresh veggies. A 12oz. New York Steak grilled your way with mashed or baked potato, and fresh veggies. Grilled or fried chicken Breast with mashed potato, and fresh veggies. Alaskan Sized chicken fried steak with homemade brown gravy, served with mashed potatoes and fresh veggies. Tender sautéed chicken breast in a creamy garlic and parmesan sauce over fettuccine noodles, served with garlic toast. Smoked Prime Rib on open faced bread with mashed potato and veggie. Pepperoni, Italian Sausage, Hamburger, Canadian bacon, Bacon, and Mozzarella on our homemade pizza sauce.